This project improved access to community wound clinics, so patients who have or are at risk of wounds can consistently receive best practice care in a timely manner. View a poster from the Centre for Healthcare Redesign graduation, August 2017. To reduce re-presentations for wound dressings and suture removals in the emergency department (ED) at Macksville Hospital by 50 per cent, by June 2018. To increase referrals to the community wound clinic by 40 per cent, by June 2018. Provides best practice care for treatment of wounds in the community. Improves the skills and knowledge of clinic staff in treating wounds. Enhances the satisfaction and confidence of staff in delivering wound care. Reduces ED presentations and associated costs for low acuity wounds. Provides holistic, multidisciplinary care for people accessing wound clinics. Reduces costs associated with inappropriate wound product use. In 2016, the Nambucca Valley Integrated Care Initiative collaborated with the University Centre for Rural Health to investigate the cause of low acuity presentations to Macksville Hospital ED. Low acuity presentations were defined as people whose wounds were not serious enough to be treated in the ED and could be treated by a community health service. Results of this investigation showed there was a lack of coordinated care for wound care at Macksville Hospital ED, with patients re-presenting to the ED over numerous days. An audit conducted as part of this investigation showed that over the previous three years, 1928 patients re-presented to the ED for wound dressings, infection management and suture removal. It was determined that redirecting appropriate patients to a community wound clinic with specialist nurse treatment and appropriate dressings would not only reduce healthcare costs and improve access to the ED, but enhance patient safety and health outcomes. Delivering care in the community would also reduce the travel time and costs associated with travelling to Macksville Hospital, as well as improve the clinical competencies of staff working in community wound clinics. As a result, patients would receive the best care, close to home and in a timely manner. The following solutions were co-designed with staff, management and people in the Nambucca Valley community. 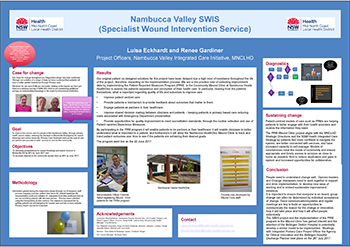 Patient Reported Outcome Measures (PROMs), which are used to help assess and follow up a patient's clinical progress, have been implemented in the community wound clinic at Nambucca Heads. Referral pathways will be developed for ED staff, to help them better manage people presenting to the ED with low acuity wounds. Information sessions and education on wound care will be delivered to staff in the local healthcare district, residential aged care facilities and general practices, as well as people in the community. A funding proposal will be developed to incorporate a Hospital in the Home model of care into the MNCLHD Integrated Care Strategy. health outcomes on admission and discharge, measured using regular PROMs surveys. number of appropriate referrals to the community wound clinic. Resistance to change is the biggest barrier and can influence the success of the project. Strong sponsorship and leadership are vital to successful implementation of change. Data collection and interpretation was difficult and consensus is vital for project progress.